The friendly and relaxed atmosphere of Bonville Golf Resort makes it a particularly attractive destination for those guests who enjoy group activities and the company of friends. Bonville features thirty well appointed accommodation rooms; including seventeen Resort Rooms, eight Executive Spa Rooms and five Executive View Rooms- all overlooking the picturesque first fairway. Here you will enjoy the peace and serenity that Bonville is famed for first hand. Located just a 10 minute drive from the CBD of Coffs Harbour and the Coffs Harbour Airport, where there are up to 7 flights to Sydney daily, Bonville is easily accessible for your next business meeting or conference yet a world away from the hustle and bustle of city life. The breathtaking beaches of Sawtell are just 5 minutes away also. Not to be missed is the Flooded Gums Restaurant where you can have a relaxing meal while taking in the magnificent panorama of the 18th fairway by day or night, the only golf course restaurant to have ever been awarded a coveted Sydney Morning Herald ‘Chefs Hat’- awarded in 2013, and again in 2014. 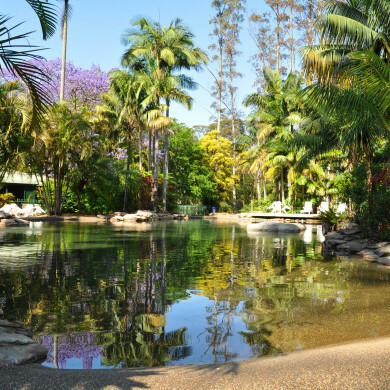 After the days golf, swim in the billabong style swimming pool, or take a relaxing rainforest walk before retiring to your onsite accommodation. All rooms feature MOLTON BROWN amenities, direct dial phone, minibar, tea and coffee making facilities, air conditioning, FOXTEL, hairdryers, iron and ironing board.